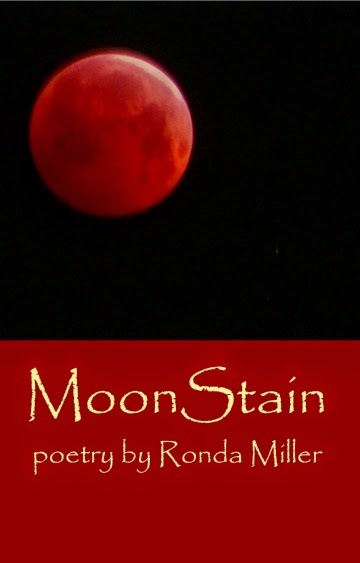 “MoonStain describes the blood moon as it shines through tree leaves, marking the long hours of sleepless night as it spreads from one point to another on a young child’s bedroom floor,” says Ronda Miller of the title poem of her collection, published by Meadowlark Books. In this collection of poetry, Miller weaves stories of life, death, and love through her poetry, primarily narrative in form. From glimpses of her childhood home on her grandparents’ farm to images of a woman’s life, her loves, her losses, we learn of life’s stains, of moments that shape and become a part of one woman’s voice. The 60 poem collection is divided into sections: New Moon, Moon Shadows, Moonbeams, and Full Moon. The book sells for $12 and will be available at online book retailers, at the Raven Book Store, from the author, and on the Meadowlark website, www.meadowlarkbooks.com. The e-book version of MoonStain will become available in June. Miller is a district president of the Kansas Authors Club and the state manager (2011-2015) of KAC’s annual poetry contests. Miller is available for poetry readings and workshops and can be reached through info@meadowlark-books.com. Ronda Miller is a Life Coach who works with clients who have lost someone to homicide. She is a graduate of The University of Kansas and lives in Lawrence. She is a Fellow of The Citizen Journalism Academy, World Company, a Certified Life Coach with IPEC (Institute of Professional Empowerment Coaching), and mother of Scott and Apollonia. She created poetic forms loku and ukol. Ronda is the co-chair, along with Caryn Mirriam-Goldberg, for the Transformative Language Arts Conference to be held at Unity Village September, 2015. Meadowlark (Emporia, KS) is an independent publisher, born of a desire to produce high-quality books for print and electronic delivery. Meadowlark is developing a collection of books that focus on a Midwest regional appeal, via author and/or topic. Meadowlark is open to working with authors of fiction, non-fiction, poetry, and mixed media.